PLEASE NOTE; We have listed IN-STOCK designs below, but can always order more. If there are NONE IN-STOCK, SELECT THE "ANY" OPTION, then we will send you whatever we get in first from the Manufacturer. 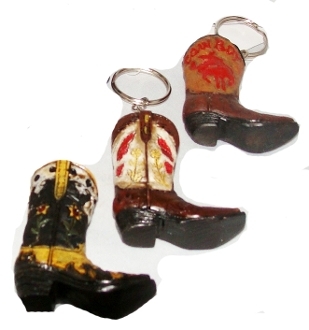 key ring & chain = 2 1/4"
BOOT IS: 2" tall x- 1-3/4 wide boot, shaft = 1" wide"